Last week we discussed the story of Noah’s Ark. We read many books about the story of Noah’s Ark, looked at various pictures of real boats, and did many experiments involving water. We also learned that the Hebrew word for ark is “teivah”. We worked together, because we have such a small class, to create an ark out of craft sticks, glue, and brown paint to create an ark. We also used blue, aqua, and green finger paint to create the water. We included pictures of stuffed animals two by two that the children brought to school. 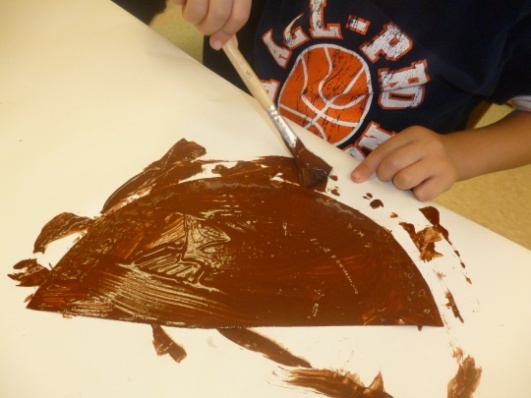 Finally, we created a rainbow using scented paint for each color. 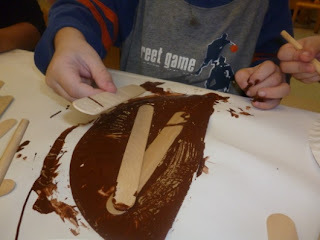 Each child also made a small Ark to take home in the same way – ½ of a paper plate, brown paint, and smaller craft sticks. When this was dry they got to put as many animal stickers on the ark as they wanted. To finish this project each child used the other ½ of the paper plate and created a rainbow with crayons, paint, tissue paper, colored glue and beads, oil pastels, and watercolors. To end our discussion, we created yummy edible Arks! 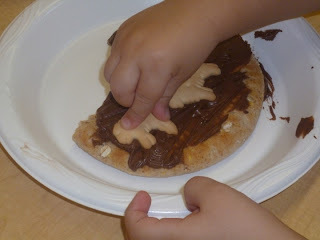 Each child got ½ of a whole wheat pita, a kid-friendly plastic knife with some chocolate frosting and animal crackers. We put the items on the plate and asked the children to create an Ark!